Kim Munson (MA SFSU) is an art historian, author, artist, and curator living in the San Francisco Bay Area. Her upcoming book From Panels to Frames: Comic Art in Museums will be published by University Press of Mississippi in 2020. Under Neurotic Raven, she has published two exhibition catalogs Dual Views: Labor Landmarks of San Francisco & On Reflection: the Art of Margaret Harrison. She often contributes essays on comic art, museum exhibitions, labor emblems, and other topics to books, academic journals, and on-line publications. Featured Publications above: Proposed Will Eisner cover for From Panels to Frames: Comic Art in Museums (Will Eisner Studios, Inc.); Book cover The Art of Margaret Harrison, featuring her prize-winning painting “The Last Gaze,” and Dual Views: Labor Landmarks of San Francisco, with a gallery photo by Tom Griscom. Kim (left) with Archivist Heather Strelecki at the archives of the American Institute of Graphic Arts in New York, 2017. The treasure hunt of primary source research is one of the joys of the type of historical writing I do. Here I am at the AIGA archives uncovering details about the important 1942 exhibit The Comic Strip: Its Ancient and Honorable Linage and Present Significance, organized for the AIGA by Jessie Gillespie Willing, a female magazine illustrator. Some historians might recognize this show from an lengthy essay written about it by M.C. Gaines for Print Magazine. The weekend after SDCC, I’ll be in Toronto participating in a round table of contributors to the upcoming UPM book The Comics of R. Crumb: Underground in the Art Museum. I’ll be talking about the different ways Crumb has been represented in exhibitions and about his influence on contemporary art, particularly the work of feminist artists Margaret Harrison and Rebecca Warren. Feb 2019 - San Diego Comics Fest. Round table on Comic Art and Exhibitions. Feb 2019 - Launch of Thomas Bentley Rue Platinum and Golden Age Comics Collection at San Francisco State University. Mar 2019 - Pop Culture Association National Convention, Washington DC. Comics as Art Criticism: the Cartoons of Jonah Kinigstein and Round table on Comics and Censorship with John A. Lent and Marc Greenberg. May 2019. National Cartoonist Society, NCSFest. Huntington Beach, CA. 2020 - Publication of From Panels to Frames: Comic Art in Museums. UPM. the Sanctuary exhibit organized by the for-site foundation at the Fort Mason Chapel. October 07, 2017 – March 11, 2018. 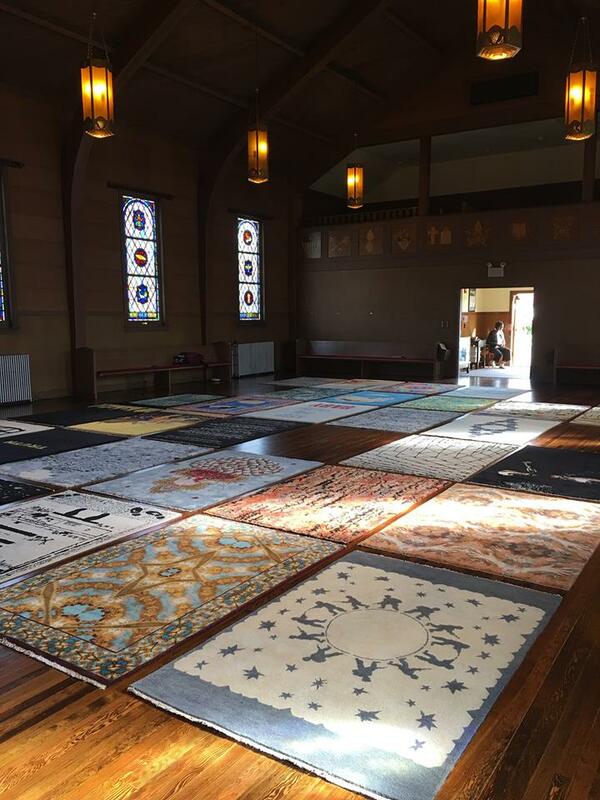 A year ago, I was a volunteer art guide for this moving and beautiful show of hand made rugs based on designs by 36 contemporary artists from 21 countries about the notion of sanctuary and what it meant to them. Every visitor I spoke with thought that this show and the setting was inspirational. Find out more about the For-Site Foundation’s public art projects here https://www.for-site.org/. dETAIL FROM “tHE mYTH rECYCLED” BY jONAH kINIGSTEIN. For my upcoming book From Panels to Frames, Columbia’s Karen Green and I collaborated on an essay about Kinigstein’s cartoons satirizing the art world and his show at the Society of Illustrators in New York. I will be presenting on this topic at the PCA convention in Washington DC.